In 2014, the Oregon spotted frog was listed as threatened by the U.S Fish and Wildlife Service (the Service). The species is present in the Upper Deschutes Basin, in and upstream of the City of Bend, which includes Crane Prairie, Crescent Lake, and Wickiup Reservoirs. The Service proposed the designation of ~22,000 acres of wetland, riverine, and reservoir habitat in the Upper Deschutes as “critical habitat”—areas which are believed to be essential to sustain and recover the species. As a result of two lawsuits in late 2015 and early 2016 filed by WaterWatch of Oregon and Center for Biological Diversity against North Unit Irrigation District and several other irrigation districts reliant on the Deschutes, a settlement agreement changed the operational procedures of Crane Prairie, Crescent Lake and Wickiup Reservoir. Under the settlement, in exchange for the commitment by the irrigation districts and the Bureau of Reclamation to make positive changes to their operational procedures, the environmental groups’ lawsuits would be dismissed. These operational changes have impacted North Unit’s access to sufficient water supply and its ability to provide for other endangered species such as the Middle Columbia Steelhead in the summer. However, the District and their partners remain committed to completing a multi-species habitat conservation plan (HCP), which represents a proactive, collaborative approach to balance fish and wildlife conservation with water use in the Deschutes Basin through innovative science-based solutions. The HCP, once approved, will result in long-term benefits to the Oregon spotted frog, bull trout, steelhead, and other fish and wildlife species, the region’s water resources, and the social and economic health of communities. The HCP will also provide “Endangered Species Act”-related liability protection to the districts. 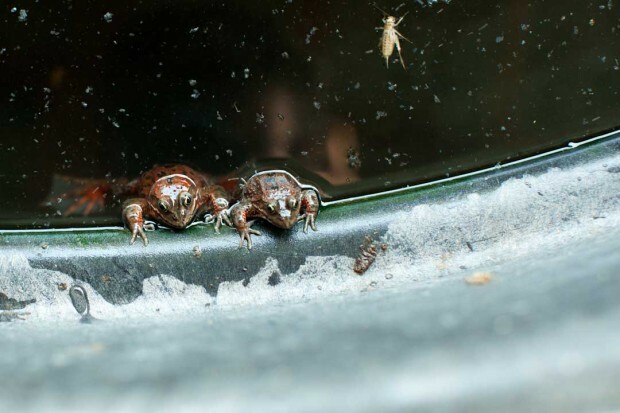 To support overwintering (September 16th through March 30th) of the frog population within the Deschutes River between Wickiup Reservoir and its connection with the Little Deschutes River, the District must release a minimum of 100 cfs from Wickiup Reservoir. This is a “five-fold” increase from the historic 20 cfs minimum, which was designed to build up reservoir storage during the winter for summer irrigation with as little waste as possible. Though historic winter discharge rates as high as 500, 600, 700 cfs have been released, these discharges were meant to balance river flows across the winter storage season when water was plentiful. In the spring (March 31st through April 30th), Wickiup Reservoir discharge must ramp up to at least 600 cfs by March 31st; and any increase in flow rate must remain and cannot be reduced until after April 30th. (Other operational conditions exist but have not significantly impacted operations to date). This flow regime does not align well with spring irrigation operations and reduces the Districts ability to optimally manage both their Deschutes and Crooked River sources. However, the District is committed to evolve with the changing basin-wide, management goals and advocates positive collaboration and stewardship for the sake of all the families, farms and fish (or frogs) dependent on this water.